By Rachel Browne. Reprinted from VICE News. First published April 18, 2018. The racial divide in cannabis possession arrests from 2015 to the first half of 2017 in cities such as Regina, Saskatchewan and Halifax, Nova Scotia is especially striking, though research has shown that cannabis use is similar across different racial groups. 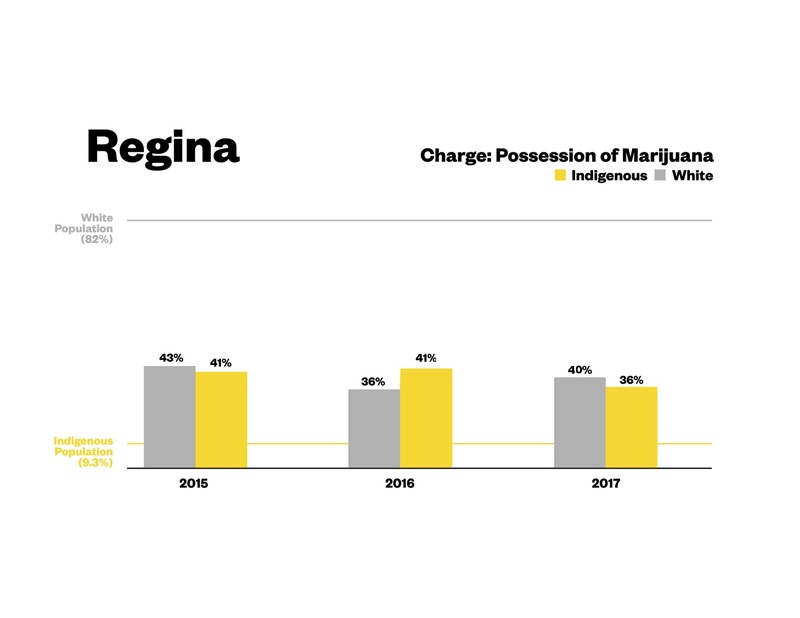 Indigenous people in Regina were nearly nine times more likely to get arrested for cannabis possession than white people during that time period. Meanwhile, black people in Halifax were more than five times more likely to get arrested for possessing weed than white people. This year, Canada is set to become the second country in the world to legalize cannabis for recreational use. And the government is facing mounting pressure to promptly clear the criminal records of those who have been convicted of the offence, and to ensure the legal recreational market provides opportunities for those who have been criminalized for cannabis possession. While Ottawa says it’s exploring granting amnesty for those crimes, it’s unclear exactly when or if that will happen. Currently, it’s up to individuals to apply for their own pardons five years after their sentence is completed — at a cost of more than $600. VICE News submitted freedom of information requests to 14 police services across Canada for single-charge cannabis possession arrest statistics from 2015 to 2017 broken down by race, age, gender of the accused, and other categories. Data related to the offence of cannabis possession was requested because it will be legal to possess up to 30 grams of cannabis after legalization, and because of the wide discretion police have in arresting and charging people for this offence. Only six police services disclosed data that successfully met the request: Regina, Halifax, Calgary, Edmonton, Vancouver, and Ottawa. All cities provided data up until the middle of 2017, except Ottawa, which provided statistics for all of 2017. Some police services, such as Vancouver, indicated the amount of cannabis the alleged offenders possessed, while others just listed the offence as general possession. These datasets were shared with University of Toronto criminologists Akwasi Owusu-Bempah and Alex Luscombe who reviewed them and provided analysis. The Ontario Provincial Police said it could not provide a breakdown of cannabis arrests by race, as the records are decentralized. The Winnipeg Police Service said it did not capture race data, and instead provided a breakdown of arrests by neighborhood. And the Montreal Police said that while it could make statistics available, they would not include race or other requested categories. The Saint John Police Service provided statistics, but did not include race as the force “only reports race where it is material to the incident (eg. Hate Crime. ),” the records response letter states. Datasets from St. John’s, Newfoundland and Charlottetown, Prince Edward Island provided only a couple dozen possession incidents since 2015, so they have been left aside. Freedom of information requests are pending with the Toronto Police and the Royal Canadian Mounted Police. VICE News and the U of T criminologists compared the race-based data from police with population totals by race for each city calculated using Statistics Canada census metropolitan data. If the term “Aboriginal” is used instead of Indigenous, it’s because that is the terminology used by the police services and Statistics Canada. For drug policy and legal experts, the dataset further supports calls for the federal government to expedite criminal record pardons (known officially in Canada as record suspensions) for those convicted of cannabis possession, and for police to halt cannabis possession arrests leading up to legalization. A 2017 Toronto Star investigation showed that black people with no criminal convictions were three times more likely to be arrested for weed possession than white people in the city with similar backgrounds, but it has, until now, been unclear what the situation looks like in other parts of Canada. In many cases, it’s unclear how many incidents in the data resulted in charges or convictions, or whether they were part of other types of charges or arrests. VICE News has previously revealed that the vast majority of criminal charges laid against employees of illegal dispensaries in Toronto in recent years, for example, were either dropped or withdrawn. It’s also unclear how many incidents in these statistics may have involved the same person. In response to requests for comment from VICE News on the findings, and the issue of overrepresentation in their cannabis possession arrests, the Regina, Halifax, Calgary, Edmonton, Vancouver, and Ottawa police services said there could be a number of factors at play, and said that their officers aim to conduct themselves with professionalism and impartiality. Some also pointed out that cannabis possession charges are laid in conjunction with other types of criminal charges. “It’s the presence of a crime, not a person’s race, that leads to their arrest,” Vancouver Police Constable Jason Doucette wrote to VICE news in an email. 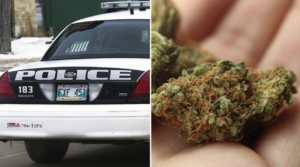 Of the cities for which cannabis arrest race data was obtained, Regina has the starkest racial divide, especially when it comes to Indigenous men and women. 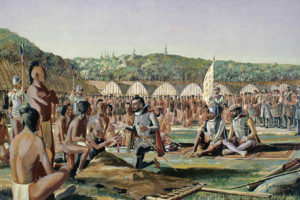 The terms Aboriginal and Métis were used in this dataset. White people, on the other hand, were significantly underrepresented in cannabis possession arrests when compared to their proportion of the city’s overall population. Indigenous people in Regina comprise 9.3 percent of the city’s population, but accounted for nearly 41 percent of marijuana possession charges laid by the Regina Police in both 2015 and 2016. That number went down to 36 percent during the first half of 2017. This is the case even though cannabis possession arrests by Regina Police declined from 198 in 2015 to 142 in 2016, and to 91 for the first half of 2017. The race for about a dozen incidents were reported as “not available” and were subtracted from the total number of arrests in calculating percentages by race. White people make up around 82 percent of the overall population of Regina, but comprise only 43 percent of the possession arrests in 2015. In 2016, white people dropped to 36 percent of those arrests, and went up slightly to 40 percent for the first half of 2017. 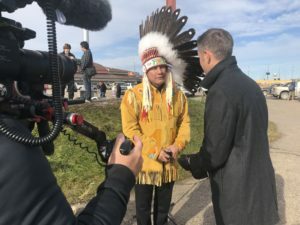 Regina criminal defence lawyer Noah Evanchuk said he and his colleagues deal with a high volume of drug prosecution cases, most of which involve Indigenous people. “What you’ll see is the simple possession of cannabis charge is the gatekeeper to get into another charge. I call it the ‘breach machine,’” Evanchuk told VICE News in a phone interview. 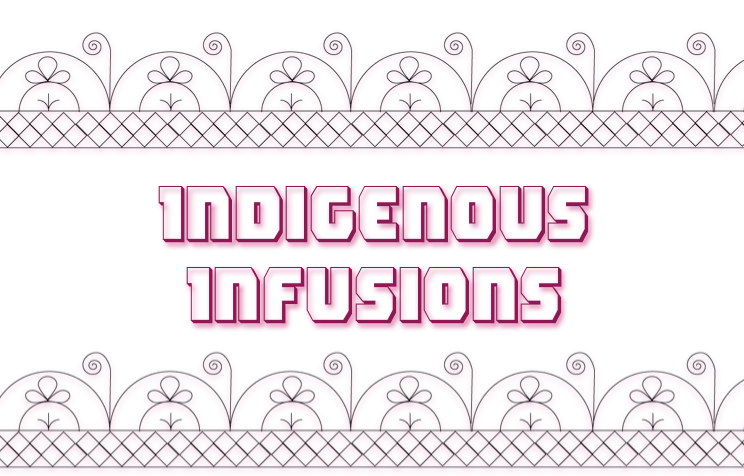 “People in Saskatchewan don’t like to talk about the level of racism in this province and the perceptions that non-indigenous people have of indigenous people … it’s really entrenched,” Innes explained. In response to the data analysis and questions from VICE News, Regina Police spokesperson Elizabeth Popowich wrote in an email that alleged offenders self-identify their race when they are held in the detention area. “We have long known that the percentage of Indigenous persons involved in the criminal justice system is higher than the percentage of Indigenous persons in our province and our cities. There is not a simple explanation for this,” Popowich wrote. “The effect of this social phenomenon is often manifested as crime and investigation into the crime results in over-representation of the minority group in the justice system. Addressing the over-representation requires addressing the root causes of the marginalization itself. While we can be part of the solution, developing and delivering effective interventions is not necessarily the work of police, who largely respond to crime (the symptom),” she continued. Data via Regina Police Service and Statistics Canada. 2017 data is from Jan-July. In the nation’s capital, Indigenous and black people, and people noted as “Middle Eastern” by the Ottawa Police Service, are notably overrepresented in cannabis possession arrests for 2015, 2016, and 2017. Overall cannabis possession arrest rates have declined there since 2015, dropping from 771 in 2015 to 680 in 2016, and to 522 last year, according to the police data. Black people comprise 6.3 percent of the city’s population, but made up 22 percent of weed possession arrests in 2015. Black men and women also made up 18 percent of those arrests in 2016, and 23 percent in 2017. Statistics Canada reports that “Arab” people make up 4.2 percent of Ottawa’s population. The Ottawa Police data shows that Middle Eastern people made up 15 percent of the cannabis possession arrests in 2015, 13 percent of the arrests in 2016, and 16 percent of the arrests last year. Indigenous people comprise around 4.2 percent of Ottawa’s population, and made up seven percent of weed possession arrests in both 2015 and 2016, and five percent of the arrests in 2017. People identified as “unknown” in the data — of which there were 16 in 2015, and 65 for both 2016 and 2017 — were subtracted from the annual totals. Lavigne pointed to a number of steps the Ottawa Police has taken to “ensure that policing is bias neutral” including an “anti-racial profiling policy review” and the “development” of a new Equity, Diversity and Inclusion Officer. Data via Ottawa Police Service and Statistics Canada. 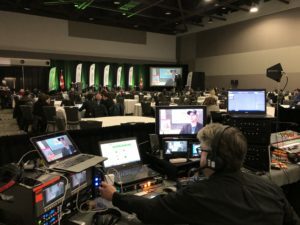 Vancouver enjoys a worldwide reputation for its cannabis-friendly environment, and has been home to some of Canada’s most prominent and vocal pot advocates. It was also one of the first cities in Canada to regulate cannabis dispensaries — in spite of the federal ban prohibiting them. The Vancouver Police Department also prides itself on taking a “progressive”approach when it comes to drug policies. However, there have been hundreds of arrests for cannabis possession in the city since 2015. And, again, Indigenous and black people are overrepresented, according an analysis of the police data. White people were arrested at rates roughly in line with their overall percentage of Vancouver’s population: around 48 percent. It was one of the only datasets that denoted the quantity of cannabis, and so only possession under 30 grams was analyzed. There were 109 incidents where the person’s race was noted as “unknown” from 2015 to 2017. Those were subtracted from the totals to calculate the race percentages. While cannabis possession arrests dropped to 609 in 2016, the percentage of those identified as Aboriginal remained steady at 16 percent. The police reported that Aboriginal people made up 11 percent of the 364 possession arrests for the first half of 2017. 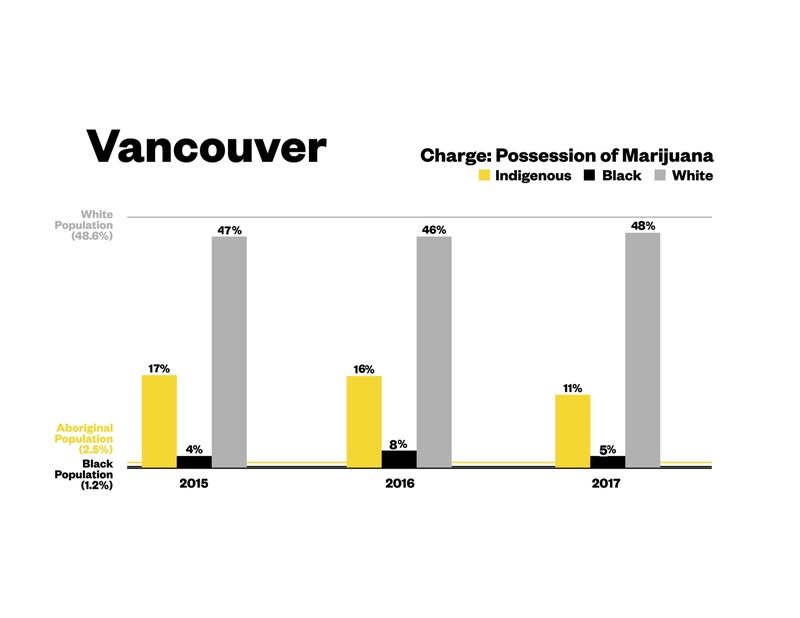 While black people represent around 1.2 percent of Vancouver’s population, they comprised four percent of the possession arrests in 2015, eight percent in 2016, and five percent in 2017. 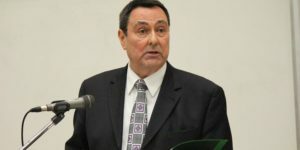 “I dont think it’s because police go out of their way to arrest Aboriginal and black people, but because of what disadvantage creates and the extent to which disadvantage draws into a public situation,” Boyd said in a phone interview. While it’s unclear how many of the Vancouver incidents resulted in charges or convictions, Boyd says even a record of arrest can cause trouble for people at the border, or when attempting to get work or volunteer positions. Data via Vancouver Police Department and Statistics Canada. 2017 data is from Jan-July. The Edmonton Police Service has been criticized for years for its practice of street checks — also known as carding that disproportionately target people of colour. It’s when police officers stop and question those who are not suspected of committing any crime. Data obtained by news outlets previouslyshows that Indigenous women, and Middle Eastern and black people are far likely to be checked by police in the city than white people. The Edmonton Police commission subsequently launched a review into the practice to determine whether it’s fair and respectful. 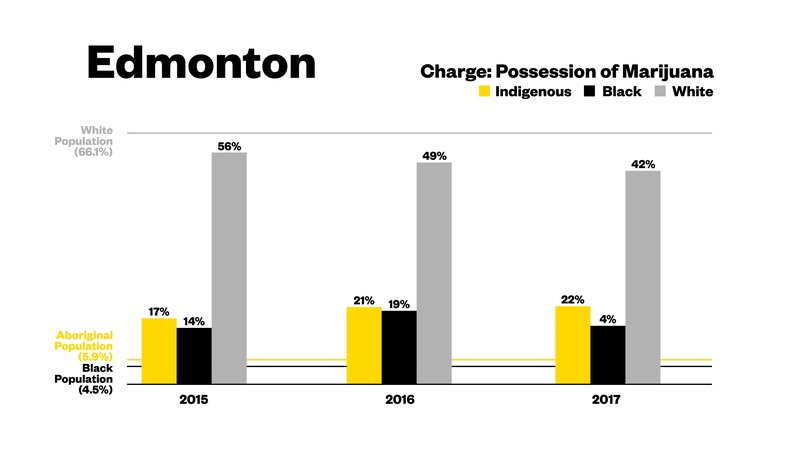 According to the Edmonton police data on arrests for marijuana possession obtained by VICE News, black and Indigenous people are overrepresented. The Edmonton police provided a breakdown of arrests for possession of cannabis not exceeding 30 grams. 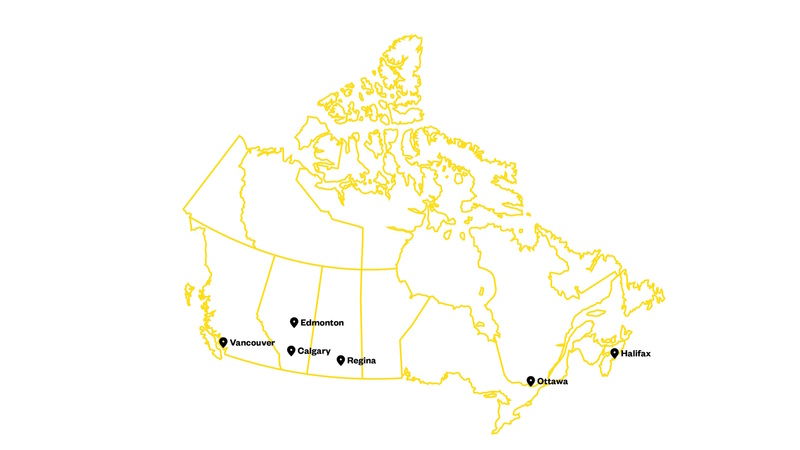 Statistics Canada reports that 5.9 percent of the city’s population is made up of Aboriginal people. Black people make up 4.5 percent, and white people comprise 66 percent. 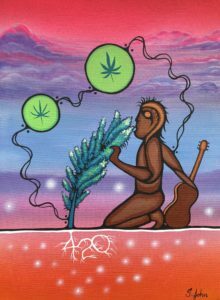 In 2015, 17 percent of the 371 cannabis possession arrests not exceeding 30 grams were Aboriginal people. That number went up to 21 percent for the 731 arrests made in 2016. For the first half of 2017, 22 percent of the 361 possession arrests were Aboriginal people. And the arrests for those timelines for black people are 14 percent, 19 percent, and 15 percent respectively. The Edmonton Police statistics were the only ones that denoted multiple races in many incidents, rendering dozens of them incomprehensible. For example, one man arrested in 2015 was reported as being “Aboriginal, Hispanic, Oriental/Asian, [Other non-white], White, Blank].” Of the more than 1,800 cannabis possession under 30 grams arrests from 2015 to the first half of 2017, 348 had to be subtracted in cases where race was unavailable or incomprehensible. The numbers supporting the overrepresentation of racialized minorities in possession arrests are not surprising to Chris Hay, executive director of the John Howard Society of Alberta. He says there’s a link between the overrepresentation in cannabis and drug arrests for racialized populations, and street checks by the Edmonton police. As head of an organization providing services and programs for people convicted of criminal offences, and having worked with the Edmonton Police for seven years on various community initiatives, he told VICE News that the city has a problem with the over-policing of people of colour. Data via Edmonton Police Service and Statistics Canada. 2017 data is from Jan-July. 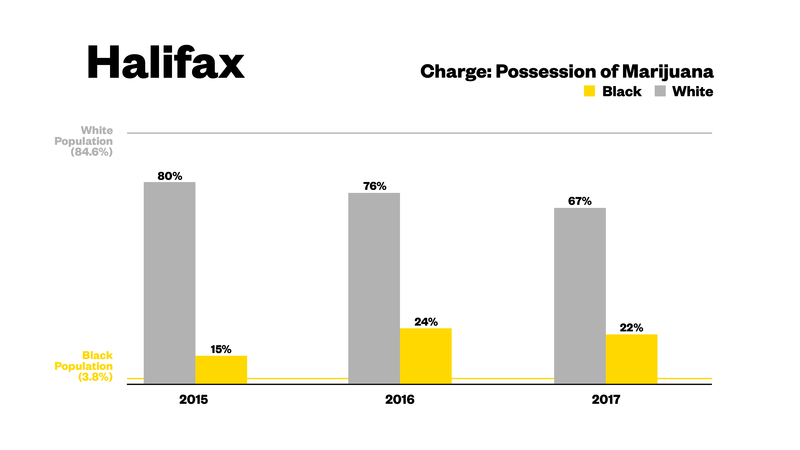 While overall arrests for simple cannabis possession have declined in recent years in Halifax, the city’s police force has been disproportionately arresting black men and women for it. Civil rights advocates in the city say these arrest rates provide further proof that the black population there continues to be over-policed. 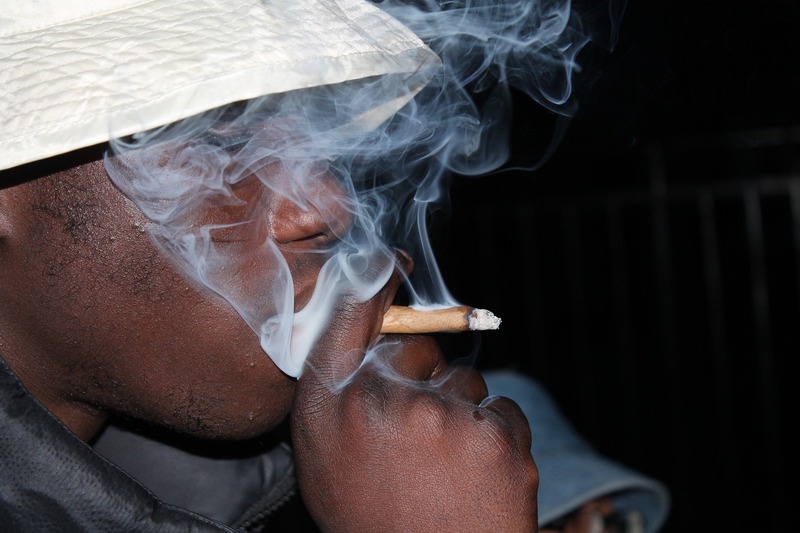 Black people comprise 3.6 percent of Halifax’s population, yet they represented 15 percent of cannabis possession arrests in 2015, which had a total of 110 such arrests. In 2016, black people represented 24 percent of the cannabis possession arrests, even though the number of cannabis possession arrests dropped to 42. One person whose race was unidentified in 2015 was subtracted from the total. There were 17 possession arrests made in Halifax from January to mid-July of 2017, 22 percent of which involved black men and women. 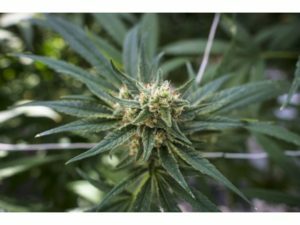 The data did not differentiate between marijuana possession and marijuana possession for the purpose of trafficking, and did not provide quantities. And there’s “not a whole lot more” to be said about the data, he continued. However, community advocates point to the practice of street checks as important context behind these numbers. Street checks in the city made headlines earlier this year after a CBC News investigation found that black people were three times more likely to be subjected to random street checks by the Halifax Police than white people. And 2016 numbers from the province’s Department of Justice show that African Nova Scotians and Indigenous peoples are overrepresented in Nova Scotia’s prison system. “It’s very troubling that at a time when there’s wide public acceptance for the legalization of marijuana … there’s a willingness to criminalize black people and there’s this underlying idea that black people belong in prison,” El Jones, a community activist in Halifax, said in an interview. Calls for a moratorium on police street checks in Halifax have been repeatedly rebuffed by by the police chief. The Nova Scotia Human Rights Commission launched a review into allegations of racial profiling during street checks, and the police say they will continue the practice at least until seeing the outcome of that review. Data via Halifax Police Service and Statistics Canada. 2017 data is from Jan-July. In Calgary, Indigenous and black people were overrepresented in cannabis possession arrests during 2015 and 2016. White people were only slightly underrepresented in those arrests compared to their proportion of the city’s population. The Calgary Police maintained race-based data on arrests during all of 2015, but stopped doing so at the end of October, 2016. “We have transferred all of our data from an old main-frame system to a new Windows based software system. Since the transfer on October 30, 2016, we have not collected any race data,” a Calgary Police freedom of information analyst said in an email. Statistics Canada numbers show that people identified as Aboriginal represent three percent of Calgary’s population of nearly 1.4 million people. Black people represent 3.9 percent of Calgarians. In 2015, Aboriginal people made up nine percent of the cannabis possession arrests for which race was noted. Aboriginal people made up 10 percent of the 280 possession arrests in 2016 up until October. Black people made up 11 percent of the arrests for 2015 and 10 percent of the arrests for that same period of time in 2016. While white people make up around 63% of the city’s population, they made up 60% of the possession arrests in 2015 and 56% of the arrests for 2016 up until the end of October. There were a total of 454 cannabis possession arrests made by Calgary Police in 2015, however nine incidents where the race was marked as “unknown” was subtracted from that total. There were 439 cannabis possession arrests in Calgary in 2016, 159 of which had no race reported and were therefore subtracted from the 439 arrests. In response to questions from VICE News, a spokesperson for the Calgary Police Service repeatedly highlighted the percentage of white people who were arrested. “Will you be including these stats as well, or are you only mentioning those of the visible minorities?” the spokesperson asked.